With a design reminiscent of the French Colonial–era manor homes that once lined the streets of Old Saigon, the all-suite Mekong Navigator features a sophisticated and comfortable ambience. 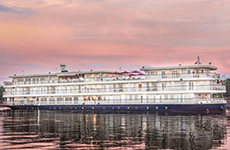 This beautiful ship — a new addition to the fleet in 2017 — carries no more than 68 guests, assuring gracious and attentive service from the impeccably-trained staff. Every suite is a beautiful and tranquil retreat, a blend of timeless elegance and modern conveniences and luxuries. Public areas include the inviting Le Salon Lounge with full-service bar on the Sun Deck, La Bibliothèque Library & Internet Lounge, the Observation Lounge, Le Marché Restaurant, and the La Vie Spa and Fitness Center.